[Spring quality] Simple sulfur spring Water-white 42 ° White Yunohana. 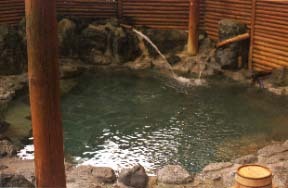 The hot spring which wells ups to the deep ravine which transfers and visits SL and a mini train.Although the hot spring of meiji 22-year discovery was sharing of the yuyama village, it sinks into a dam and the present hot spring is the hot spring newly struck in Showa 30.The sulphuric white hot spring where mineral extraction flew is called "hot spring of the production of a beauty. "It is on the South-Alps southern part route of the South-Alps Mt. Tekari south foot, and is used also for the mountaineer.As for the promenade involving the suspension bridge and Hiryuu-kyo of a dream, please carry out skilled [ of "the 100th elections of the nature of Japan which wants to leave in the 21st century" ] for about 1 hour and 30 minutes. Open-air bath "hot spring of the production of a beauty"
An Abt system 26 km, 1 hour and 40 minutes, and only [ Japanese ] from a Senzu to Ikawa. Transparency and colorlessness, white Yunohana. 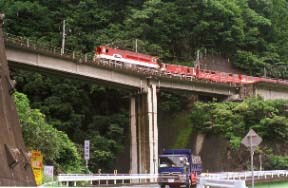 Kanaya station -> it is about 60 minute -> Chikami station -> sumata going bus 45 minutes with Ohigawa Railway and SL. It is about 15 km about a Senzu to the prefectural road 77.